Quick overview For some four centuries the Ottoman Empire had been one of the most powerful states in Europe as well as ruler of the Middle East. By 1914 it had been drastically weakened and circled by numerous predators waiting to finish it off. This book recreates one of the most important but poorly understood fronts of the First World War. ECONOMIST BOOKS OF THE YEAR 2015. SUNDAY TIMES TOP TEN BESTSELLER. The final destruction of the Ottoman Empire - one of the great epics of the First World War, from bestselling historian Eugene Rogan. For some four centuries the Ottoman Empire had been one of the most powerful states in Europe as well as ruler of the Middle East. By 1914 it had been drastically weakened and circled by numerous predators waiting to finish it off. Following the Ottoman decision to join the First World War on the side of the Central Powers the British, French and Russians hatched a plan to finish the Ottomans off: an ambitious and unprecedented invasion of Gallipoli...Eugene Rogan's remarkable new book recreates one of the most important but poorly understood fronts of the First World War. 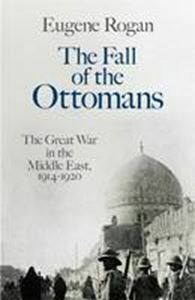 Despite fighting back with great skill and ferocity against the Allied onslaught and humiliating the British both at Gallipoli and in Mesopotamia (Iraq), the Ottomans were ultimately defeated, clearing the way for the making, for better or worse, of a new Middle East which has endured to the present.